Other designations: Virgins' Convent; Surp Hripsime; Kusanats Vank; Bekhents Vank; Kizlar Manastırı; Kutsal Rahibeler Manastırı; "Sepulchral Church". 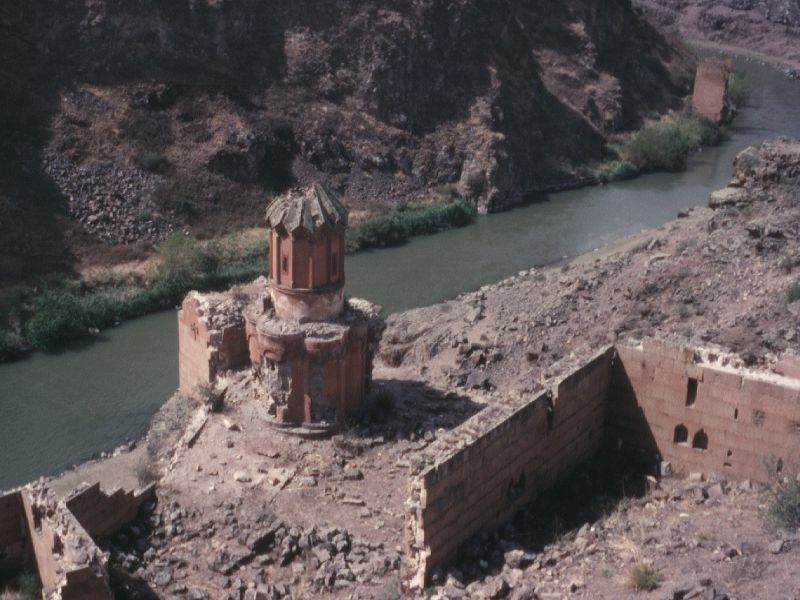 This small monastery stands on a rocky promontory, isolated from the rest of the city and overlooking the Arpa/Akhurian River. 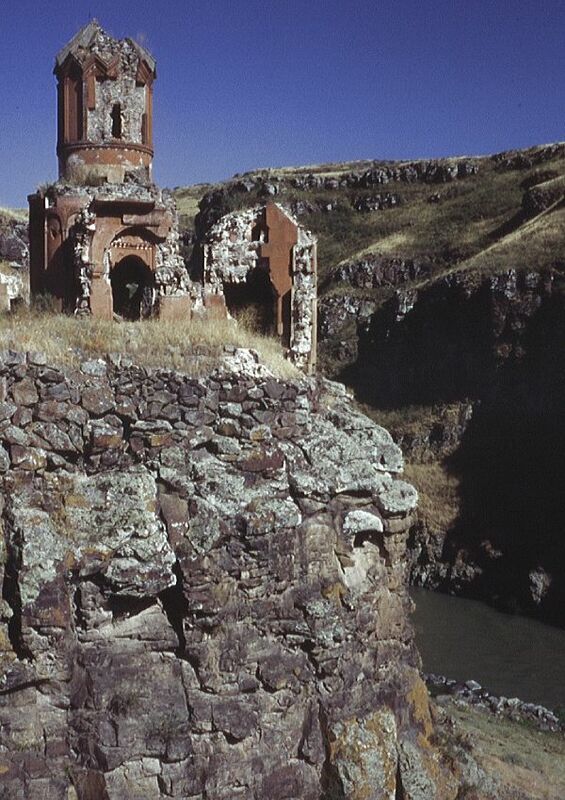 It was named after the virgin martyrs of Saint Hripsime, and may have contained a community of nuns. Within a walled enclosure are the remains of several buildings: the most important being a tiny, slender, and very attractive chapel. The chapel contains no building inscriptions - it most probably dates from the early 13th century, but may possibly be from the first half of the 11th century. It is now an extremely picturesque ruin - a cute little building of reddish stone perched on a pinnacle of rock. 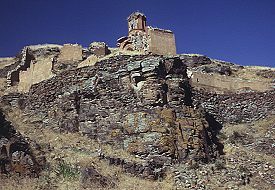 An inscription on the Church of Saint Gregory of Tigran Honents mentions a nearby monastery called Bekhents, restored by Tigran Honents. It has been suggested that Bekhents was this monastery. The drawing above is by Texier, published in 1842, and below is by Brosett, published in 1860. The chapel has a complex design despite its diminutive size. The whole of the exterior emphasises the building's verticality. The roof over the dome is particularly complex: a multi-gabled cap, shaped like a half closed umbrella, rises from a zigzag moulding. 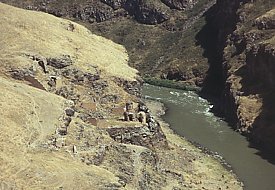 This is the only surviving example of this sort of roof at Ani, but it may have originated in this region. 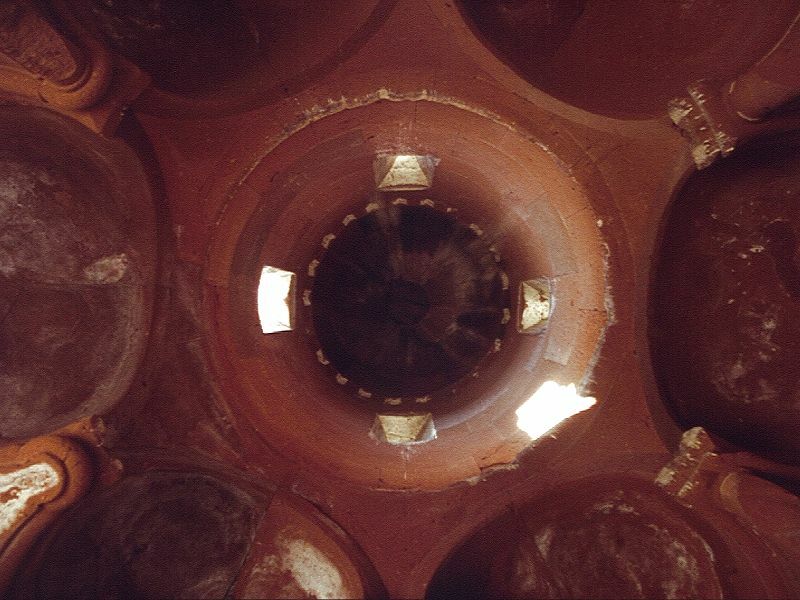 The dome of the St. Sarkis church at Khtzkonk monastery has a similar design, with an early 11th century date. Externally, the drum of the dome is divided into twelve faces, separated by clusters of three colonnettes. Blind arcading also divides the curving external wall of each apse into three faces. Each arch of the arcade contains a different design of interlace pattern, and the spandrels between each arch are filled with a foliate ornament. 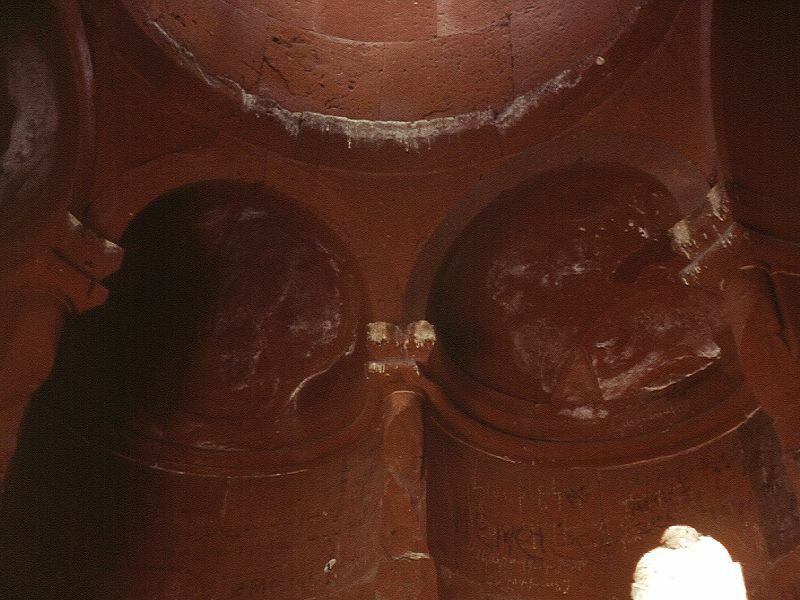 As well as carved decoration, paint was used to decorate parts of the exterior: the stone still has traces of dark-red and creamy-white pigment. It is applied in a subtle way, giving the effect of tinting the stone. Sometimes it is applied directly onto plain facing stone, such as the band of rhombuses underneath the cornice of the lower roof, alternately painted light and dark to create a zigzag pattern. 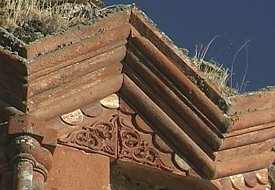 Sometimes it is applied onto carved elements, such as the row of half circles that run around the base of the drum and also under the triangular gables of the umbrella roof. 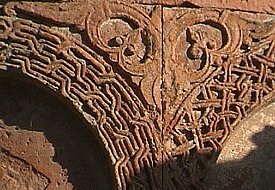 Some of the interlace patterns on the arches of the blind arcade also show signs of having been painted. Inside the church are six tiny apses around a central circular space, above which is a miniature cupola resting on a tall, cylindrical drum. 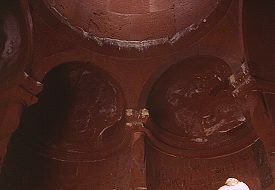 There are four windows in the drum, and another in the eastern apse. The interior is very plain, and without frescoes. The entrance is through the western apse, in front of which once stood a small porch. Abutting the church to the south is a small, rectangular, single-nave chapel with a semicircular altar apse. 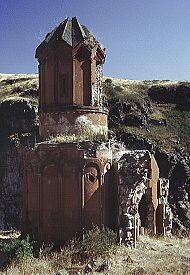 Although small, multi-apsed, centrally planned churches like this are found in Armenian architecture, they are unusual for this late period. 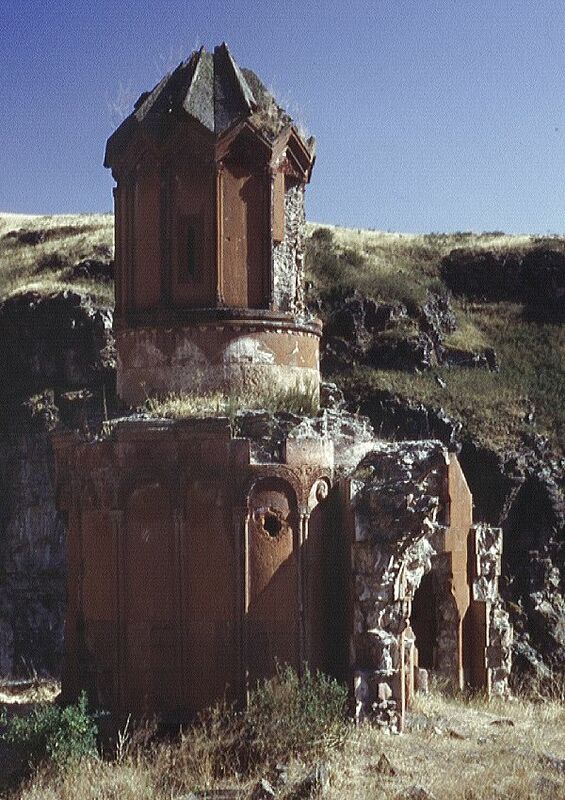 Perhaps the design was influenced by Turkish "kumbet" tombs, or by the similar, but earlier, church in Bagnayr monastery. This page [Monastery of the Virgins] as first published in 1999. It was last modified on the 27th April 2002.